Pluot and Plum Perfect Parfait. Plumb Delicious! Granola Fatigue. 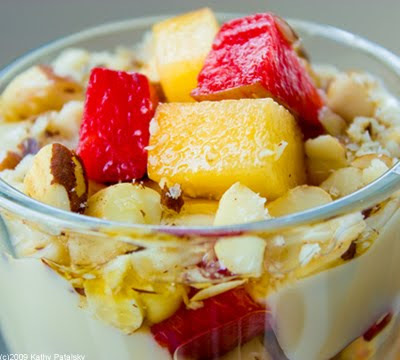 I'm really bored by granola in my yogurt parfaits. I'm not a huge fan of granola cereal, so why mush it in my yogurt. You may feel differently, but give this recipe a try and see if you go back to grains. 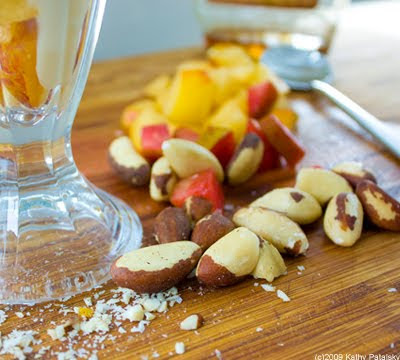 I find that simple chopped nuts add all the crunch I need to get me through the yummy layers. Dry granola just makes me thirsty! 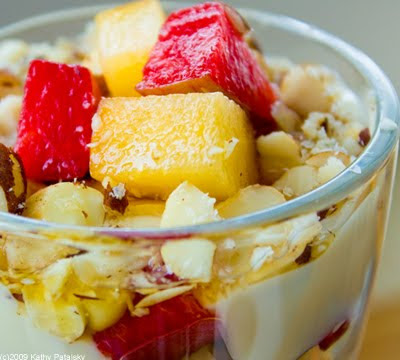 Granola free parfaits are the answer to a hydrating yet satisfying yogurt-based breakfast. 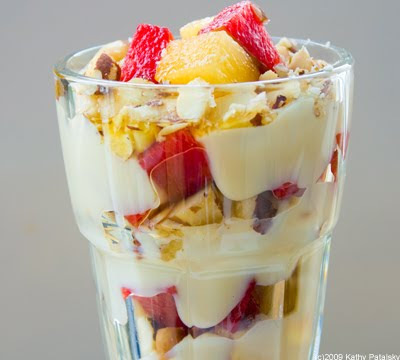 Healthy Parfait. 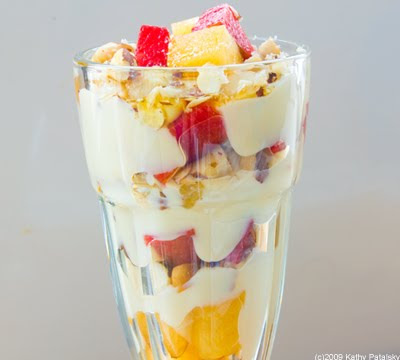 What do you get (nutritionally speaking) when you munch this parfait? Antioxidants and fiber from the fruit. 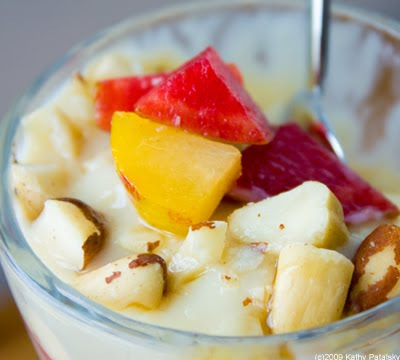 Protein and probiotics from the yogurt. 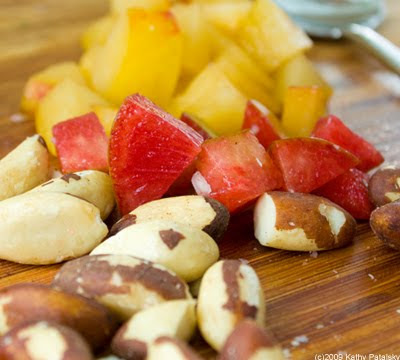 Fiber and healthy fats from the nuts. Nutrition approved! Instead of saying: "It's so hot outside." You say: "It's plumb hot outside!" Instead of saying: "We ran all the way to the river and back in five minutes. We were really tired." Say this: "We ran plumb to the river and back in five minutes! Golly we were plumb tired!" 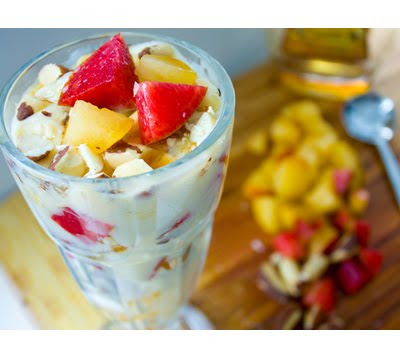 Now that you have the lingo down, here's the recipe for this summer sweet parfait that tastes as pure and gleeful as childhood. 1)This is super simple. Yay. 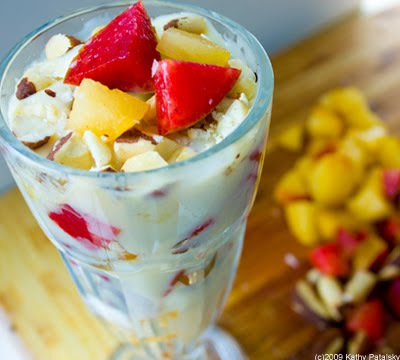 So step one is to grab a tall parfait glass and smile wide as you layer your ingredients! 6) Repeat until you make it to the top brim of the glass! 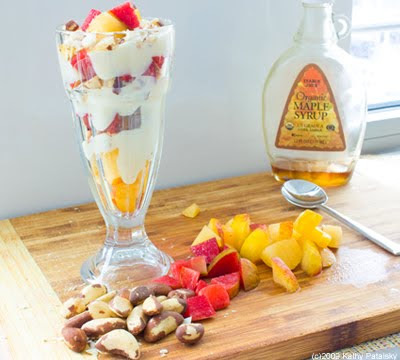 7) Top with a few fresh fruit chunks, nuts and a 1 tsp drizzle of maple syrup. After your first bite say: "Wow! This is plumb delicious!" How classic Tom Sawyer of you. "Well, to cut the tale short, we never left there till plumb noon; and long before that I was hid in this stateroom; for before breakfast I see a man coming, away off, that had a gait like Hal Clayton`s, and it made me just sick. I says to myself, if he finds out I`m aboard this boat, he`s got me like a rat in a trap. All he`s got to do is to have me watched, and wait--wait till I slip ashore, thinking he is a thousand miles away, then slip after me and dog me to a good place and make me give up the di`monds, and then he`ll--oh, I know what he`ll do! Ain`t it awful--awful!" to come back, and kept hoping they would, but they never did. set down, everybody; don't lose no more time."